The Great New York State Fair 2013 festival is held annually in Syracuse, NY August 22 to September 2nd, and expects over 1 million people in attendance for the concerts, carnivals, contests and festival events. Take best route to Binghamton, NY then take Interstate 81 North into Syracuse, then follow Rt. 690 West. *The line up has not been finalized yet, so please check back to see more days of concerts filled. As of now, here are the performers that have committed. The Great New York State Fair festival is a 12-day showcase of agriculture, entertainment, education and technology. With midway rides, concessionaires, exhibits and concerts, it has become New York’s largest annual event and an end-of-summer tradition for hundreds of thousands of families from all corners of the state. The first fair took place in Syracuse in 1841 and took permanent residence there in 1890. It is the oldest and one of the largest State Fairs in the United States: with approximately one million visitors annually, it is ranked third behind Minnesota and Texas. The Great New York State Fair begins on the third or fourth Thursday in August and runs for 12 days, ending on Labor Day. 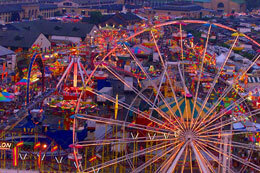 The 2013 fair will run from August 22 – September 2. February 1832 – The New York State Agricultural Society was founded in Albany by a group of farmers, legislators, and others to promote agricultural improvement and local fairs. September 29–30, 1841 – The nation’s first state fair is held in Syracuse, New York. There an assembled 10,000-15,000 people heard speeches by notables and viewed animal exhibits, a plowing contest, and samples of manufactured goods for the farm and home. 1842 – The second New York State Fair festival is held in Albany, and ushered in an era of growth and travel for the institution. February 1889-September 1890 – Syracuse Land Co donated to the Agricultural Society a 100-acre (40 ha) tract of land in Geddes (Onondaga Co) crossed by railways that facilitated exhibit transport. This parcel has served as the fair’s permanent home since. Late 1890s – Burdened with debt from constructing permanent buildings on the site, the Agricultural Society turned to state government for relief. New York State purchased the grounds in 1899 and took over management of the fair the next year, creating the 11-member State Fair Commission appointed by the governor. 1908 – The first structure in a $2 million long-term building plan was erected, with subsequent buildings completed at intervals over the next two decades, the most notable building being the Manufacturers and Liberal Arts Building, now the Center of Progress Building. 1910 – The Dairy Products Building and Grange Building (now the Science & Industry Building) are added to the Fairgrounds. 1923 – The Coliseum opens and hosts the World’s Dairy Congress. 1950s-1960s – The fair expanded to nine days and gained an attendance of over 500,000 by the end of the 1950s. The James E. Strates Midway is added to the fair along with nationally known entertainers both of which attracted families and teenagers. 1980s-1990s – Fair officials respond to criticism noting slim minority presence by adding gospel festivals and a Pan-African village display. The event also added sign language interpreters and made its grounds accessible to people with disabilities. 1990 – The fair expands from 11 to 12 days; the format continues to be used to this day. September 7, 1998 – The state fair closes one day early for the first time due to the Syracuse Labor Day Derecho. The storm resulted in two casualties on the fairgrounds. 2001 – Over 1 million attend the 12 day fair for the first time. With 1,011,248 attendees, this year still holds the overall attendance record. 2008 – Fair administration focuses more on agriculture with exhibits showcasing products made in New York State such as the Pride of New York Marketplace and a permanent maple exhibit. 2009 – The fair changes its Chevy Court format to include two different performers each day. Popular rock band Shinedown performs for an estimated 15,000 people, breaking the previous record set in 1972. 2010 – Country trio Lady Antebellum’s performance on Chevy Court breaks 2009’s record with an estimated 30,000 attendees. A record of 206,000 fairgoers attends Chevy Court concerts during the 12 day run. Paid attendance at the fair hits an all-time high, while the total attendance was the third highest in history at 999,845. August 31, 2011 – Bruno Mars breaks the Chevy Court attendance record yet again with an estimated 35,000 in attendance. In recent years, the state fair administration has reestablished and enhanced the annual state fair’s role in promoting agriculture, local food production, and New York State businesses. The addition of the Pride of New York Marketplace has increased fairgoers’ knowledge of products created in New York State. Additionally, a permanent maple stand, farmer’s market tent, and restaurants featuring only food with ingredients from New York State have been added to the growing list of fairgrounds attractions. 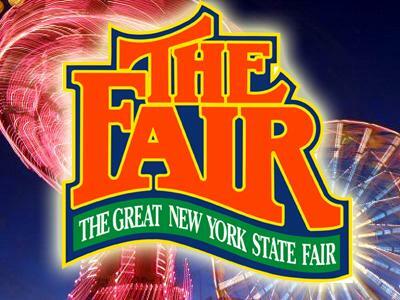 Since 2008, the state fair administration has made several efforts to make the New York State Fair a more family friendly environment which has eliminated public safety incidents over the past four years. Attendance has increased or remained consistent each year with records made in paid attendance, State Fair Grandstand concert attendance, and Chevy Court concert attendance over the past three years. 2010 marked the third highest attended fair in history, with 999,845 attendees. 2010 and 2011 each had days in which the record attendance for one day was broken, in one instance by more than 20,000. 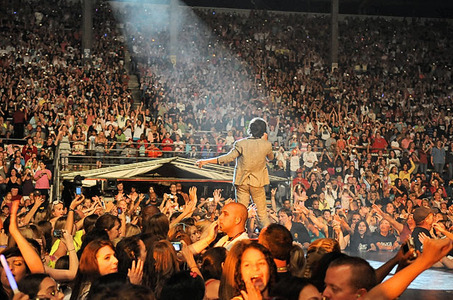 The State Fair Grandstand hosts events including sell-out concerts presenting a wide variety of national performing artists such as Justin Bieber, Aerosmith, Journey, and many, many others. It also hosts the widely popular Demolition Derby each fair season. In February 2010, the Grandstand made national headlines when it hosted the first outdoor game in American Hockey League History. Chevy Court – the fair’s free concert series is becoming one of the best free entertainment venues in the country and has broken attendance records year after year for three consecutive years. In 2009, the fair changed its format to feature two different national performing artists every day. Before that, the same artist performed twice on the same date, limiting opportunities to attract additional people to the fair by offering acts with different audiences. Chevy Court performances attracted an estimated 150,000 people in 2009 and more than 170,000 in 2010 and over 200,000 in 2011. The stage has hosted performances by Lady Antebellum, Bruno Mars, REO Speedwagon, Big Time Rush, and many, many others. In recognition of the fair’s innovative approach to entertainment, Chevy Court and its lineup was named the best free concert venue in Central New York in 2009, 2010 and 2012 and best state fair attraction in 2011 by the Syracuse New Times, a regional arts and entertainment publication. New in 2011, the New York State Fair hosted six concerts on the Talent Showcase Stage in addition to the Chevy Court Concert Series and the concerts and events at the State Fair Grandstand. With artists such as The Cab, Andy Grammer, and former lead Guns N’Roses guitarist, Buckethead, the new series proved to be a success, bringing in new Fairgoers to the west end of the fairgrounds. In 2012, the concerts on the Talent Showcase Stage were revamped to be known as the Midway Music Series, hosted nine performances by local, regional, and national touring artists including Tyler Hilton, Outasight, and The Downtown Fiction. The New York State Fair has a wide variety of free, family-friendly entertainment and attractions. These shows include jugglers, one man bands, educational animal shows, and more. The fair also features a petting zoo and circus. All grounds entertainment attractions are included with fair admission. The Midway features several rides, funhouses, games, and concession stands that appeal to fairgoers of all ages. The 2011 fair brought four new rides such as the Sky Flyer, a 98 foot tall tower swing that lifts fairgoers 50 feet in the air at a rate of 30 miles per hour. 2011 also brought a new look to the fair’s 126-foot high Ferris wheel with new LED dancing lights that can be seen in all areas of the fairgrounds. Each year, the fair has ride-all-day wristbands available on select days where the purchase of a wristband allows fairgoers to ride-all-day for one set price. In addition to the Midway is Kiddie Midway which features rides and games for younger fairgoers. Approximately 70 rides are located in both the Midway and Kiddie Midway. Agriculture is a large component of New York State, and a big part of the fair as well. The fairgrounds are large enough to host plenty of displays, events, competitions, and attractions that teach fairgoers the importance of agriculture. In 2011, the fair had over 14,000 animals entered to be exhibited including horses, dairy cattle, rabbits, dairy goats, and more. In addition to animal entries, 2011 brought in over 9,000 agricultural entries including antique tractors, beverages, Christmas trees, flowers, forage, grain, and 4-H. For some, this is the only opportunity to see livestock up close and to meet with the men and women of New York State who grow and raise agricultural products that feed and clothe them. The fair also strives to promote New York grown products and foods. In 2008, the Pride of New York Marketplace occupied a permanent structure right at the main entrance to the fairgrounds. The Marketplace is stocked with foods made in every corner of New York State including gourmet sauces, syrups, and pastas. An additional Pride of New York display can be found in the Horticulture Building on the fairgrounds. The main entrance of the fair also features a farmers’ market that offers fresh New York State produce and other foods to fairgoers as they enter or leave the fairgrounds. The NY Café and NY Grill, found in the fair’s Horticulture Building and Infield, offer a wide variety of breakfast, lunch, and dinner options with ingredients and products only found in New York State. The Center of Progress Building is one of the largest of the 110 buildings on the fairgrounds. Located just inside the fair’s main gate, the building is one of the first structures seen by hundreds of thousands of people as they enter the Fairgrounds. It is located along the perimeter of Chevy Court which has hosted concerts with record breaking numbers year after year. A favorite among fairgoers, this prime location hosts up to 250 vendors and concessionaires, and has recently become home of the fair’s 180 ton sand sculpture. The 375-acre fairgrounds complex operates year-round as the Empire Expo Center, and annually hosts more than 500 non-fair events. These range from major entertainment and sporting events to a variety of equestrian competitions, consumer shows, community events and meetings that keep the fairgrounds teeming with people. Super DIRT Week, the nation’s premiere modified stock car racing event, attracts an estimated 100,000 people from as far away as Washington State and California. The Syracuse Nationals, one of the top five classic car shows in the country, draws nearly 80,000 people to its weekend event at the fairgrounds. Nearly 70 percent of attendees are 35 to 65 years old, making it one of the largest gatherings of baby boomers in the Northeast. The fairgrounds is a key player in New York’s equine industry, hosting more than 40 horse events each year, including some of the most prestigious competitions in the Northeast. Last year, 65 trade and consumer shows brought nearly 400,000 people to the fairgrounds. A total of 50 entertainment events ranging from major rock concerts to community theater productions attracted 133,235 people. The Center of Progress Building is the home of the massive, 180 ton sand sculpture. This exhibit is one that keeps fairgoers coming back day after day as a team of sculptors work their magic throughout the 12 days of the fair. In 2011, the fair received an overwhelming amount of positive feedback as they paid respect to the victims of 9/11 with a sand sculpture recognizing the 10 years that had passed since the terrorist attacks. Past sand sculpture themes have included The Beatles, Syracuse University, USS New York, The Olympics, and many, many more. The State Fair Coliseum was built in 1923 and its first event was the World’s Dairy Congress. 5,000 people came to view the million-dollar mile of bovine lords and ladies of every color and breed. Dairy cattle were brought in from 40 different countries. In 1947-48 SU held their basketball games there and in 1949-1952 the NBA Syracuse Nats called this home. The game in ‘49 set all-time records for which most still hold for the most points, most fouls, most free throws, most missed free throws, most overtimes, and longest game. During the fair, the Coliseum is used mainly for the multi breed horse shows which include breeds such as Pinto’s, Arabians, Miniature horses, Quarter horses, Morgan, and Appaloosas, hunter/jumpers as well as the draft breeds and the heavy and light horse pulls. This arena also accommodates the Holstein Dairy Cattle Show on dairy day, the 4-H agility dog show, and a variety of shows on Labor Day. This large but graceful structure is one of the most beautiful buildings at the fairgrounds. Its intricately designed entrance, fronted by the fountain in the State Park reflecting pool, is an easily recognized fair landmark. Its proximity to the fair’s veterans’ memorials and the 9-11 memorials make it a regular stop for many visitors to the fairgrounds. During the fair, it hosts many horticultural exhibits and concessionaires including the famous $1 baked potato booth, the New York Maple Center, and produce, flower, and apple exhibits. The building’s versatile design allows a wide variety of events to be held there throughout the year. It includes the fair’s New York Café, which operates during the fair and selected events. Located in the Dairy Products Building is a must-see attraction for fairgoers of all ages, the butter sculpture. 800 pounds of unsalted butter have made this a fair favorite since 1969. The revolving butter sculpture can be seen at the center of the Dairy Products Building. Once the fair is over, the butter is converted to biofuel to fuel college buses by students of the State University College of Environmental Science and Forestry in Syracuse. The butter sculpture is sponsored by the American Dairy Association and Dairy Council. Although only 10 vendors are located in this family oriented building during the fair, it is packed to capacity every day. It is one of the buildings that almost every fairgoer has on his or her check list to visit. At the top of the list is the butter sculpture at the building’s heart, and next is probably the best tasting chocolate milk in the world, sold at the Milk Bar for just 25 cents. In 2012, 403,189 cups of milk were sold to fairgoers, breaking an all-time record at the New York State Fair. Another reason people visit the building is to meet the Dairy Princesses, enjoy the free entertainment on center stage, and sample fudge, baked goods, yogurt, chocolate covered strawberries, milkshakes, pints of tantalizing ice cream flavors, and of course, ice cold milk. This building is a favorite among agriculture enthusiasts. During the twelve days of the fair, it is home to some of the state’s best dairy cattle exhibitors. During the off season, it is utilized as an exhibit building and hosts many trade shows for both the public and various industrial groups. This impressive, century-old structure serves as an anchor for Chevy Court. During the fair, a wide variety of health and safety-related exhibitions help to make this building one of the fair’s most popular visitor destinations. The Art & Home Center is home to a recently renovated demonstration kitchen, which has been the host of several celebrity cooking demonstrations by such notable chefs as Adam Richman, Bobby Flay, Mario Batali, and others. The Art & Home Center is the hub of all culinary, art, and craft exhibitions as well as a selection of unique vendors which appeal mostly to women. Each year, the Art & Home Center hosts its annual Women’s Day Luncheon. In 2009, the building celebrated its 75th anniversary by celebrating the life of suffragette Harriet May Mills, whom the building is dedicated to. The building also hosts an impressive display of circus and carnival models during each year’s State Fair, including a model layout of the current year’s State Fair midway. The Art & Home Center contains the Empire Theatre. In addition to being home to local theatrical productions by local theater companies such as the Syracuse Talent Company, the theatre houses a 1925 Wurlitzer Co. 3 manual 11 rank theatre pipe organ, opus 1143, which was moved from the RKO Keith’s Theatre in downtown Syracuse in 1967. This building serves as a staple for food enthusiasts during the fair, where fairgoers can choose foods from select countries around the world. In 2010, the International Pavilion was redesigned to feature more seating and an all-new New York Beer and Wine Pub. An educational building meant to “educate” youth and families attending the fair, this building is constantly packed with parents and children. Everyone leaves with something on their minds and in their hands. Upstairs serves as a dormitory for 4-H and FFA youth that are competing at the fair. There are 800 beds, lockers, full shower/bathroom facilities, and laundry. Downstairs has a variety of interactive sections for the youth to participate in, including a newsroom, demo kitchen, animal husbandry, crafts, and GPS mapping. 2 Responses to "Great New York State Fair"